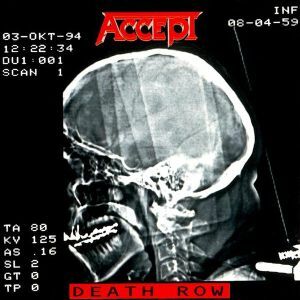 ACCEPT - DEATH ROW RE-ISSUE (CD) | Online Shop | Wizard LTD. Album: "DEATH ROW RE-ISSUE (CD)"
Death Row is the tenth studio album by German heavy metal band Accept, released in 1994. It was recorded at Roxx Studios. Stefan Kaufmann was still the official drummer for Accept, but drums on "Bad Habits Die Hard" and "Prejudice" are by Stefan Schwarzmann according to the liner notes. Stefan Kaufmann had to leave the band for the subsequent tour because of health problems, and Stefan Schwarzmann then handled drum duties. Stefan Schwarzmann – drums on "Bad Habits Die Hard" and "Prejudice"